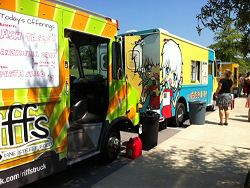 Tell us what you think about Food Trucks! 1. I have eaten at a mobile food vendor outside of Nashville and Davidson County, and my experience was: *This question is required. 2. I have eaten at a mobile food vendor within Nashville and Davidson County, and my experience was: *This question is required. 3. I am more likely to visit an area where there are mobile food vendor dining options: *This question is required. 4. It is likely that I would dine at a mobile food vendor in the morning: *This question is required. 5. It is likely that I would dine at a mobile food vendor in the afternoon: *This question is required. 6. It is likely that I would dine at a mobile food vendor in the evening: *This question is required. 7. It is likely that I would dine at a mobile food vendor in the late night: *This question is required. 8. What Best Describes you? *This question is required. 9. I am aware of the new Mobile Food Vendor program that is piloting in Nashville and Davidson County: *This question is required. 10. What recommendations would you make to the City of Nashville regarding their current Mobile Food Vendor program pilot or Mobile Food Vending in general? *This question is required. 11. Anonymous surveys may be reviewed, however, due to the nature of anonymous responses, anonymous responses will not be tabulated or relied upon for decision-making. Please enter your valid e-mail address to make your comments count! This question requires a valid email address.